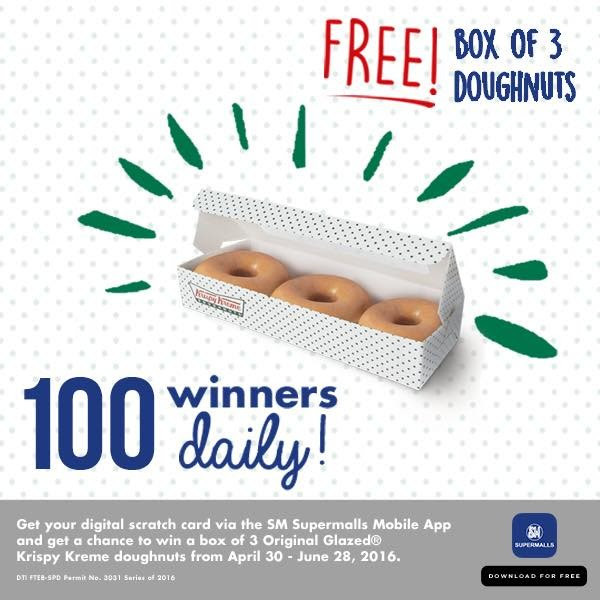 SM Supermalls is bringing back its “Download & Win” in-app mobile game and is making the sweetest noise by giving away 3 Original Glazed® Krispy Kreme doughnuts to each 100 unique SM Supermalls mobile app registered users every day from April 30 to June 30, 2016! So what are you waiting for? Download it now!!! Also, make it a habit to check the app regularly as the “Download & Win” feature in the SM Supermalls app. It was marked with the giving away of exciting prizes such as free mobile data, free Spotify, Facebook, Games, Unli-Call and Unli Text every day for the entire month of March in celebration of its 30th year. The celebration resumes this month with a shower of doughnuts! And joining can’t be simpler – just download the mobile app and scratch!